The formative years of Britain's most notorious gangsters are portrayed with brutal honesty in RISE OF THE KRAYS, released on Blu-ray and DVD on August 31, 2015, courtesy of Signature Entertainment. In 1961 Ronnie and Reggie Kray began a reign of terror that would endure and define London’s East End right up until today. From protection rackets to members clubs, from brutal street brawls to arson via blackmail extending to the Cabinet Office, the Krays exacted out their own unique form of punishment on anyone who crossed them. To get more of an idea of what the two siblings got up to, this feature takes a look at The History of The Firm. 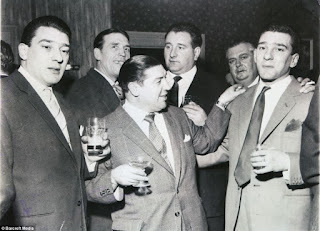 The Kray 'Firm' consisted of 'Colonel' Ronnie Kray, his twin brother Reggie Kray, Ronnie Hart their cousin, Albert Donoghue, Ian Barrie, Pat Connolly, Big Tommy Brown, known as the Bear, Billy Donovan, Connie Whitehead, Sammy Lederman, Dave Simmonds, Nobby Clark, Scotch Jack Dickson, John Barry, Tony and Chris Lambrianou and Ronnie Bender. Leslie Payne and Tommy Cowley were the known brains of The Firm, often giving credibility and respectability to many of illegal deals and approaches. A few gang members were recruited after they had suffered at the request of the Twins, or in some cases after being personally attacked by them. Albert Donoghue was shot in the leg by Reggie for uttering a threat against them, weeks later he was welcomed into the Firm and put on a pension. He went on to became one of their most trusted members. The Firm worked on an information basis. The Krays would always help small time criminals who had just been released from prison or when they were down on their luck in return for favours in the future. The trade off was they were to be the eyes and ears of the Kray Firm. Nothing happened in London without the Twins knowing or without them getting their piece of the action. The Firm also worked on a sort of franchise system where certain members of the gang, such as Tony and Chris Lambrianou, who would use the Kray name and reputation to conduct their business activities. The Lambrianou brothers operated all over the country content in the knowledge that they had the backing and the muscle of the Firm. The Twins weren't interested in what they were doing so long as they received their percentage. It was felt by many that if the Twins had taken more of a back seat when it came to settling disputes, and recruited more able business partners then the history of gangland Britain would probably have to be rewritten. However, The Twins eventual downfall came about with the help of many of the "loyal and trusted" members of their the Firm.